Name: Local Color- And Beyond! 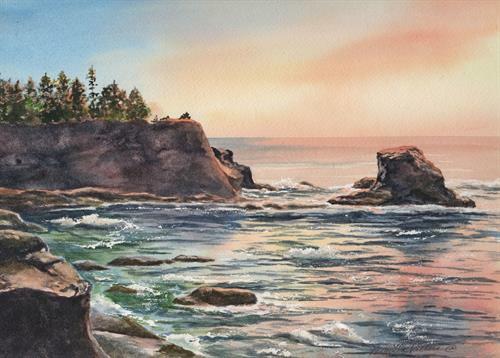 Original paintings in oil and watercolor by award winning artist, Priscilla Patterson featuring scenes in and around the Pacific Northwest will be on display in The Gallery at the Fifth Avenue through the month of September. A former Alaskan, Priscilla taught art at Kodiak (Alaska) College for 18 years. She is a member of the American Society of Aviation Artists, serving as Education Chairman, the Canadian Aviation Artists Association, the Coast Guard and Air Force Art Programs, and holds a certification in Composite Drawing for Law Enforcement. Priscilla is the recipient of the 2012 Distinguished Service Award presented by the American Society of Aviation Artists. Since 1984, her work has received awards and recognition in Alaska and beyond. Locally, her work can be found at the Blue Whole Gallery in Sequim. September 1 through September 29, 2018, noon-5 PM.